Saul ‘Canelo’ Alvarez returned to the ring one month after undergoing an arthroscopic surgery to remove cyst from his right knee. Canelo hasn’t played since settling for a draw against Gennady ‘GGG’ Golovkin for the middleweight belts in September last year. The two were scheduled to lock horns again but Canelo pulled out of the May 5 rematch after being tested positive for a banned substance. And with a September 15 comeback against a yet-to-be-confirmed opponent on cards, the Mexican looked as sharp as ever in his first practice in a month’s time. 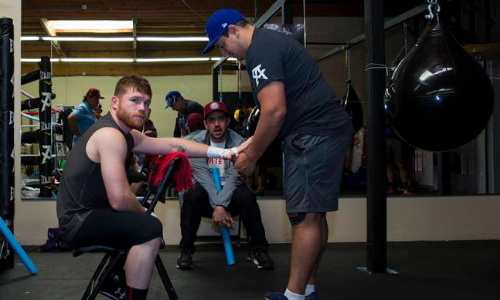 In a video posted by FightHype, Canelo – with his right knee covered – can be seen smashing the focus mitt with his trainer at the gym. And boy, such was his power that one may mistake the sound of the punches for gun shots (excuse the hyperbole). Meanwhile, Canelo has reportedly offered Golovkin 42.5 per cent of their split for a rematch, for which the Kazakh superstar has been given time until Thursday to make a decision. Should the rematch not materialize, Canelo is likely to make his return against former WBA champion Daniel Jacobs.